Student-centered learning, also known as learner-centered education, broadly encompasses methods of teaching that shift the focus of instruction from the teacher to the student. In original usage, student-centered learning aims to develop learner autonomy and independence  by putting responsibility for the learning path in the hands of students. Student-centered instruction focuses on skills and practices that enable lifelong learning and independent problem-solving. Student-centered learning theory and practice are based on the constructivist learning theory that emphasizes the learner's critical role in constructing meaning from new information and prior experience. 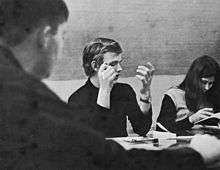 Theorists like John Dewey, Jean Piaget, and Lev Vygotsky, whose collective work focused on how students learn, have informed the move to student-centered learning. 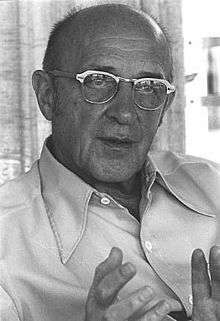 Carl Rogers' ideas about the formation of the individual also contributed to student-centered learning. Rogers wrote that "the only learning which significantly influences behavior [and education] is self discovered". Maria Montessori was also a forerunner of student-centered learning, where preschool children learn through independent self-directed interaction with previously presented activities. Development of a model of a broadly based teaching and learning environment inﬂuencing the development of generic capabilities to provide evidence of the need for an interactive learning environment. ↑ Jones, Leo. (2007). The Student-Centered Classroom. Cambridge University Press. ↑ Rogers, C. R. (1983). Freedom to Learn for the 80's. New York: Charles E. Merrill Publishing Company, A Bell & Howell Company. ↑ Pedersen, S., & Liu, M. (2003). Teachers’ beliefs about issues in the implementation of a student-centered learning environment. Educational Technology Research and Development, 51(2), 57-76. 1 2 Hannafin, M. J., & Hannafin, K. M. (2010). Cognition and student-centered, web-based learning: Issues and implications for research and theory. In Learning and instruction in the digital age (pp. 11-23). Springer US. ↑ Young, Lynne E.; Paterson, Barbara L. (2007). Teaching Nursing: Developing a Student-centered Learning Environment. p. 5. ISBN 078175772X. ↑ Johnson, Eli (2013). The Student Centered Classroom: Vol 1: Social Studies and History. p. 19. ISBN 1317919491. ↑ Armstrong 2012, p. 2. ↑ Vygotsky, L.S. (1980). Mind in Society. p. 89. ISBN 0674076699. ↑ Crumly, Cari (2014). Pedagogies for Student-Centered Learning: Online and On-Ground. p. 26. ISBN 1451489536. ↑ Crumly 2014, p. 26. ↑ Jahnke, Isa (2012). "A Way Out of the Information Jungle". In Coakes, Elayne. Technological Change and Societal Growth: Analyzing the Future. p. 182. ISBN 1466602015. ↑ Wright, Gloria Brown (2011). "Student-Centered Learning in Higher Education" (PDF). International Journal of Teaching and Learning in Higher Education. 23 (3): 93–94. ISSN 1812-9129. ↑ Attard, Angele; Iorio, Emma Di; Geven, Koen; Santa, Robert (2014). Student-Centered Learning SCL Toolkit. Brussels: European Students' Union. ↑ Kember 2009, pp. 10,12. ↑ Kember 2009, p. 12. ↑ Geven, K.; Attard, A. (2012). "Time for Student-Centred Learning?". In Curaj, Adrian; Scott, Peter; Vlasceanu, Laz?r. European Higher Education at the Crossroads. ISBN 9400739370.